Dr. Alvan F. Bucknam, whose sign as a physician and surgeon has become a familiar spectacle to the people of Warren and vicinity, is a practitioner who enjoys the confidence of his patrons in a marked degree. He has had a wide and varied experience in the medical profession, although by no means an aged man, having improved his opportunities, and kept his eyes open to what was going on around him in the world. A native of New England, he was born in Yarmouth, Me., Nov. 27, 1838, and there spent the years of his boyhood and youth. He obtained a thorough education, being graduated at Bowdoin College, from the literary department as M. A., and from the medical department in 1863. At the expiration of this time, the Civil War being in progress, Dr. Bucknam enlisted, in Company G, 25th Maine Infantry, and was elected First Lieutentant (sic). At the expiration of his first term of service he veteranized (sic) in the Second Massachusetts Cavalry as Assistant Surgeon, and remained in the army until the close of the war, much of the time under the command of Gen. Sheridan in the Army of the Potomac, and along the Shenandoah Valley. When the conflict was ended, he spent a year in New York City with his medical books, and practicing in the hospitals. In the fall of 1866 he made his way to this county, locating first in Nora, where he began the regular practice of his profession, and continued four years. Thence he came to Warren in 1870, and is now the oldest physician living in the place. An unqualified supporter of Republican principles, Dr. Bucknam uniformly gives his support to his party, and, although no office-seeker, has been a member of the School Board a period of twelve years. Socially, he belongs to the G. A. R., and the Masonic fraternity. He has built up a large and lucrative practice extending all over the county, and to points adjoining. He was married, June 28, 1871, to Miss Jane, daughter of Judge Ivory Quinby, of Monmouth, Ill., and this union has been blessed by the birth of two children, both of whom are living: Mary Lizzie and Anna Belle. They have been given excellent educations, and remain at home with their parents. Mrs. Jane (Quinby) Bucknam was born in Berwick, Warren Co., Ill., March 14, 1849, and remained with her parents until her marriage, receiving a thorough education and careful training. Her father, Judge Ivory Quinby, was a native of Maine, and a man of much force of character and prominence. He was graduated from Waterville (now Colby), Me., and commenced the reading of law under the instruction of Judge Shepley, of Portland. 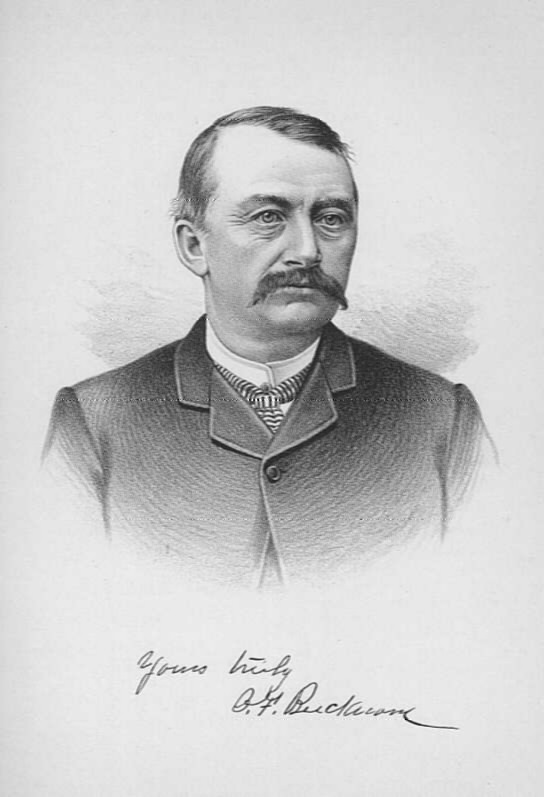 After being admitted to the bar he came to the West, locating in Warren County, Ill., where he became prominently identified with its local interests, and in due time, after filling other positions of trust, was elected Judge of the county court. He practiced law in Monmouth, and married Miss Mary Pierce for his second wife. They reared a family of four children, and Judge Quinby died in 1869. His widow was subsequently married to the Rev. Richard Haney, and is still living in Monmouth Township. The father of our subject was William Bucknam, a native of Yarmouth, Me., and born in October, 1806. He departed this life at his home in Maine, in 1850. In his youth he went to sea, and was for some time previous to his death master of a merchant marine vessel. He married Miss Mary True in 1835, and they reared a family of five children, three of whom arc living. The wife and mother survived her husband a number of years, passing away at her home in Yarmouth, Dec. 24, 1884.